If you are looking for a north or north east Texas golf stay and play package, then you need to read this golf stay and play review of The Links at Land's End. We've played the Links at Land's End several times and always enjoyed it - great conditions, reasonable rates, and some excellent holes. The challenge is that it's a tad isolated - an hour and a half east of Dallas - which means it creates an perfect excuse to make it a Stay & Play weekend. 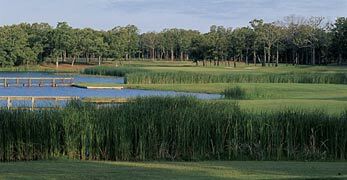 The Golf Stay and Play at The Links at Land's End is perfect if you're looking to escape the hustle and bustle of the city, enjoy a peaceful and serene round or two of golf in the country, sample some east Texas country cooking, and maybe cast a line and catch a big bass. So round up your golfing buddies or best friends and head out to Land's End for a weekend or overnight stay and some great golf. Land's End is located in Yantis (where in the world is that?) which is on the shores of Lake Fork about 90 miles east of Dallas. The Lodge at The Links at Land's End opened in September of 2008 and it's a short walk from the Lodge to the Pro Shop, restaurant, swimming pool, and driving range. 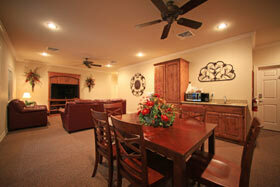 The Lodge is two adjacent buildings each of which has six guest rooms that open into a common lounge area. All of the rooms have two full size beds, flat screen TV with cable, mini refrig, coffee maker, and a bathroom with a tub and shower. We found the rooms to be clean and comfortable and spacious - nothing special or unique about the rooms but good enough for a fun weekend. 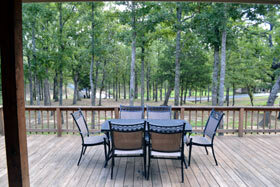 Each of the Lodge buildings have a large deck with a table and six chairs overlooking the trees and a cove on Lake Fork in the distance. The decks are a perfect place to start the day with a cup of coffee or end a round of golf with a cold drink and some games. Each building also has a common area that has a large comfortable leather sofa and chair, big flat screen, mini fridge and ice maker, and a game table with six chairs - a perfect for a small meeting or a round of games or poker. But you don't come to Links At Land's End to stay cooped up in a room, you're here to play some golf, enjoy the country, and take advantage of the lake. Let's start with some golf. 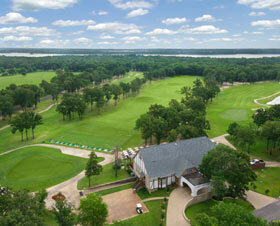 Ranked #37 in the 2014 Dallas Morning New's "Top 50 Courses You Can Play" and #100 in the "Best 100 Courses in Texas"
The fairways are flat but take advantage of all the trees and Lake Fork to make for a fun, scenic, and challenging round - what more can you ask for! The first five holes are pretty straightforward and traditional as they play through the Land's End housing development and some huge beautiful homes that could come into play if your really spray the ball. By the end of the fourth hole you're probably scoring well, got your game together, and saying "this is not so challenging and where's the lake?" Bask in your glory for awhile and then pull out your A game because from hole 6 on you're going to need it. Water, tight fairways, thick rough, doglegs, narrow approaches, strategically placed bunkers, reeds and trees, and well protected small greens are going to challenge you from here on out! In fact, holes 8 through 11 are known as "Amen Corner" and have been known to ruin what set out to be a great scoring round! 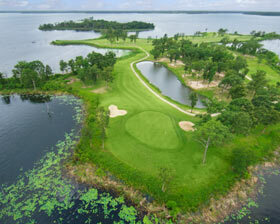 These 4 holes play along Lake Fork and although they aren't that long (#11 is the longest par 4 at 457 yards) they are deceivingly tough. 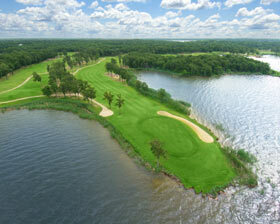 Take #8 for example, a short 380 yard par 4 that is the #1 handicap. The drive needs to be precise to make the 90 degree dogleg, avoid the reeds and lake on the right, the trees to the left, and not over-shoot the fairway. Then you need to stuff the approach shot and get the ball to hold on a small oblong green that is well protected by the lake and a bunker - par this one and the rest of "Amen Corner" may see easy! Each time we have played The Links at Land's End, the conditions have been well above average. 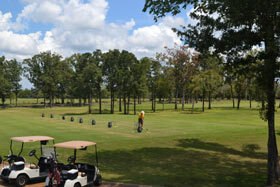 The 419 Bermuda fairways are well groomed and the rough is playable. If you miss the fairway and end up in the trees, its not that difficult to chip back to the fairway and save a par. The majority of the 50 bunkers protect the greens and the sand is soft and thick. The TIF Eagle greens were in very good condition, about average speed, and relatively easy to read which made one or two putts very common. Bottom line, The Links at Land's End is an outstanding 18 holes that is well worth the drive. Read our review of Links at Land's End to learn more. 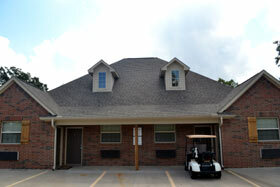 The clubhouse is home to a well stocked pro shop with everything you'll need to look and play good. Outside the pro shop is Jacky's Pub restaurant with a small bar area and a long outdoor veranda that overlooks the driving range and 18th green. The restaurant is open 7 days a week an extended lunch and drinks. On Friday and Saturday, the restaurant is open for dinner and it's pretty good. Chef Matt changes the menu and typically has a special, which when we were there it was rack of lamb and it was delicious. Some of the other options on the dinner menu were prime rib, chicken, and salmon. The dinner prices are a tad high and the service is excellent. Before you head out to play golf, stop by the Pro Shop for some new gear. 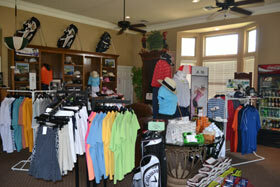 The Pro Shop is well stocked with everything that you'll need to play well and look good doing it. And don't forget to warm up on the driving range and putting green before you head out - put particular emphasis on accuracy with your short game. 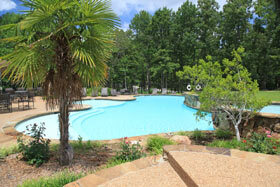 Bring your bathing suit because after a round during the hot Texas summer, you won't be able to resist the pool! And why not bring your boat if you've got one and after golf get out on Lake Fork. Within a 9 iron shot of the Lodge is a boat ramp in a protected cove, however, the lake level was down about 5 feet and we couldn't launch our boat from the ramp. We found a public ramp about 10 minutes away and enjoyed an afternoon on the lake. Read our review of Lake Fork and here is an interactive map of Lake Fork to help you get acquainted with the lake. Lake Fork is 27,690 aces and 315 miles of shoreline and it is best known for it's fishing. In fact, Lake Fork is respected as one of the top 3 bass fishing lakes in the United States and of the record largemouth bass catches in Texas, 18 out of the top 25 came from Lake Fork, with the average weight from Lake Fork being 16.74 pounds! So bring your fishing pole and I'll bet if you ask nice, Chef Johnny will cook your catch for you. Better yet hire a fishing guide and let them take you to where the big ones are just waiting for you. Here is a list of some Lake Fork fishing guides. Talk to the pro shop and get a recommendation on a guide and I'll bet the guide will pick you up at The Links at Land's End. I know that the pro shop sends golf carts out to the 15th hole to pick up some of the fishing guide's clients and bring them to Jacky's for breakfast or lunch - and then shuttles them to the boat to catch some more fish. 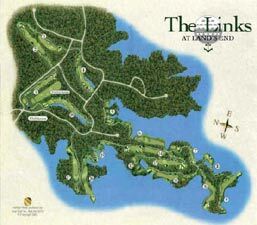 Bottom line - Links At Land's End is a fun, tranquil, serene, and challenging outlying course that you will want to play again. Deploy some good club selection and course management and you can have a very good round. 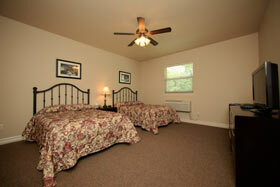 The lodging is adequate, comfortable, clean, and affordable. The food is ok and service is great. And the fishing is outstanding. Check out their and give them a call. Remember, golf relieves stress as does getting away from the hustle and bustle of the city and escaping to the quiet and peaceful countryside.